5 things we learnt from West Brom 0-1 Arsenal: Giroud’s performance against Manchester United was a false storm, Cazorla has taken a rebirth, Martinez doing wonders for Arsenal. In this early Premier League weekend fixture which saw the top contenders Arsenal to collide with the relegation threatened West Brom, it was the Gunners that came out on the top at the end of a exhausting finale. Even though Arsenal created a handful of chances one of which they were able to convert, West Brom might complain that the referee made some mistakes which went in Arsenal's favour. Although this feet can be momentary as Manchester United are currently playing Hull City side, a win was much needed to put Arsenal season back on track. After that draw with Anderlecht a fortnight ago which started a nightmare for Arsenal, a draw against Swansea and a defeat against Manchester United put their fans into serious doubt regarding the future of Arsene Wenger. However, with 2 wins in 2 games this week, their form has taken a right turn. 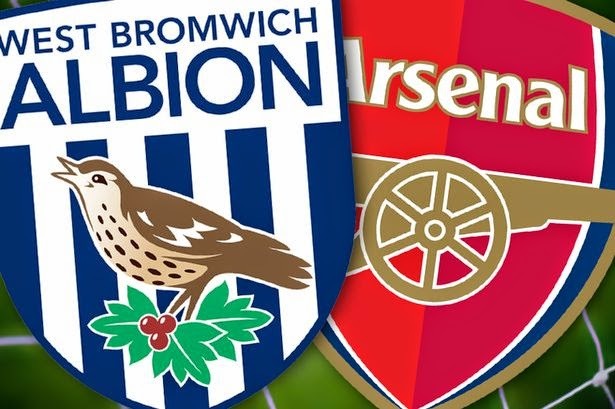 Even though they managed 9 attempts on Arsenal goal only 1 of which was on target, West Brom might feel they were undone by some sloppy refereeing by the linesman. At the half hour mark when Berahino was through on goal courtesy of a through ball that divided the Arsenal defense into half, the linesman pointed the flag to deem the West Brom striker as offside. However, when viewed on the replay, Berahino was at-least 2 yards on side and wrongly mitigated by the linesman. Similar decision ensued in 2nd half when Brunt was deemed as offside after he inadvertently blocked his team-mate’s shot and was going after the loose ball. So if those 50/50 decisions would have gone into West Brom favour which they will on any other day, a different score-line was possible today. From his dream comeback against Manchester United when he put a belter against David de Gea, it was thought that the Frenchman would come out tossing grenades on the opposition defender, a feeling which was only met by dismay when the 90 minutes completed today. Being a part of the front three that included the likes of Danny Welbeck and Alexis Sanchez as the other two, Giroud wasn’t able to manage that physical defending of Joleon Lescott as the former Everton and Manchester City defender left him scathed. That in itself, is a reality check and was seen as coming. And that may help Giroud when his side will play on Emirates in mid-week. At the end of last season when Cazorla was caught as saying that he joined Arsenal for winning trophies before the FA Cup final, it was thought that the Spaniard was itching to go back to Spain and the rumours throughout the summer didn’t help his matter as he was continuously linked of going out from the Emirates. However, as they say you success should make the noise, the Spaniard has done exactly the same as 3 assists in last two games have redefined his role this season. From getting ball at the edge of half line and then distributing it perfectly to his forwards, Cazorla is un-arguably the second most in-form striker for Arsenal after Sanchez at the moment. Although the new keeper has just started his career at the Emirates, he has shown such quality that Arsenal were lacking since the departure of Jens Lehman. From his clean sheet against Borussia Dortmund to his performance today, the 3rd choice keeper for the Gunners might become a headache for the other two.